Our 8 ft. tipi is an exact replica in miniature of our full size Sioux Tipis. The smoke flaps and lacing pins function exactly like our full-size tipis, and the tipi set-up procedure is the same as our larger tipis. The 8ft. 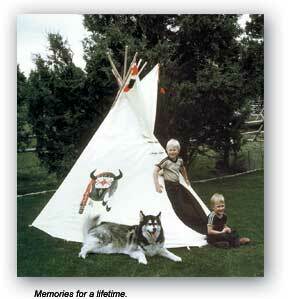 Sioux Tipi can be set-up outside in the yard, or on a porch or a deck. 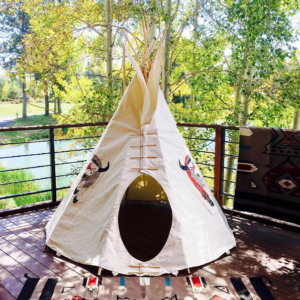 Also, because the tipi is approximately 8 ft. in floor diameter and stands only 7 ft. high, it will set-up easily in the den, playroom or in a child’s bedroom – thus the children can use their tipi year-round, indoors or outdoors. Because the 8ft. 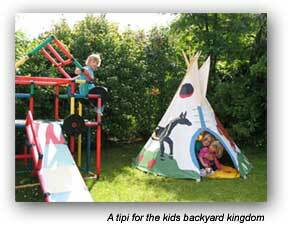 tipi is so easy to set-up, the kids can take it over to a friend’s house for the weekend. 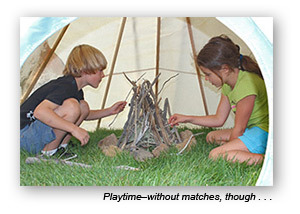 The tipi is also an ideal educational toy that children can grow with. From a pre-school rainy day hide-out, through cultural studies at school, camping-out in the yard, and scouting, the kids will get years and years of use from their tipi. 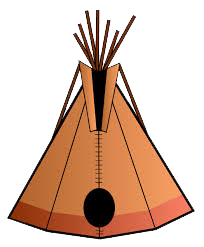 Also, to help give children a special appreciation for their tipi, within the set-up instructions there is interesting and educational information on the architectural and cultural history of the Native American Tipi. 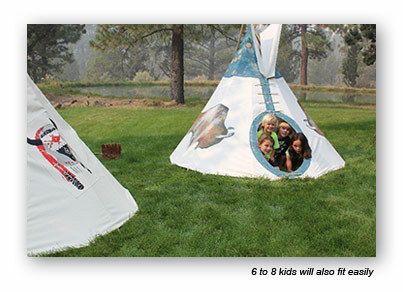 6-8 children can easily play in the 8ft tipi – or two adults and one child can use it for a summer overnight stay. Caution: Kids tipis are designed for play only. 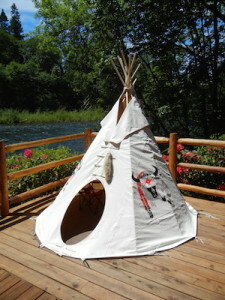 Do not build a fire or use a stove or heat source in this 8ft tipi! Our 8ft. 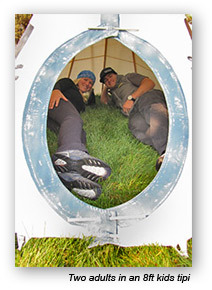 white canvas tipi is made from our 15 oz. Sunforger flame retardant canvas. The tan fabric is non-flame retardant. We use the same thread and stitching as on our full size tipis. The lift pole flap area and both the pinning facing have been reinforced with two layers of canvas. The 8ft. tipi comes complete with everything you need to set it up: 22 x 4ft wooden tipi poles and plastic tubes used to sleeve them together to make 11 x 8ft poles, wooden lacing-pins, and very strong, safe plastic tent stakes. The tipi comes with simple, easy-to-follow, step-by-step set-up instructions, including numerous photographs. One person can set-up the tipi in about 45 minutes. As a special feature, the tipi has a beautiful printed two-color silk-screened design on each side of the door hole. This special design is a Buffalo Skull Shield trimmed in eagle and hawk feathers with sacred hoop-rings and a red trade blanket sash. You may order the tipi with or without the Buffalo Design for the same price of $250. If you would like us to custom paint your tipi, please call us for a quote on your design. 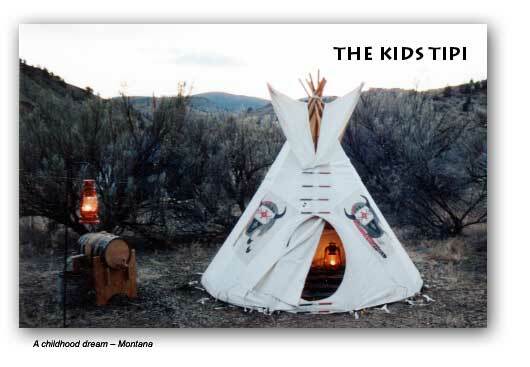 If you like, we can send you the tipi without the Buffalo Skull silk-screen, so your children can paint their own tipi with their favorite designs. Any brand of exterior house paint will work and will hold up for many years. 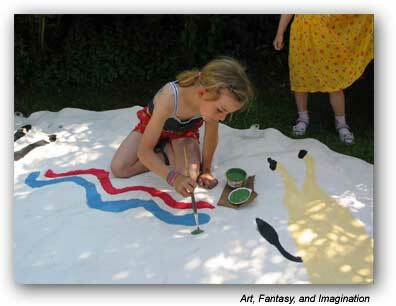 Children can also add additional decorations to their tipi. The wooden lacing-pins can be painted and feathers, ribbons, or horsehair can be hung from the tops of the tipi poles or from the ends of the smoke flap pockets. Our 8ft Sioux Tipi is shipped to you via United Parcel Service. We usually have them in stock and ready for immediate delivery. We accept VISA and MASTERCARD. Orders paid by Credit Card or Money Order will generally be shipped the next day they are received. Price: $250 plus U.P.S. shipping, which ranges from $35 for the Pacific Coast to $60 to the East Coast. Please call for a shipping estimate to your location.